Wellmax has been designing and manufacturing shopping carts since 1981. Wellmax makes the best shopping carts without question. Buy the best, but with confidence. JUMBO SIZE This lightweight and sturdy folding utility cart is ideal for anyone on the go. Perfect for urban and city living, day to day grocery runs, laundry pickup, or everyday hauling. Constructed of a high quality rust-free metal, our shopping cart folds flat for easy storage in the trunk or under seats. Ideal for the subway or quick trips to the corner grocer, local deli, bakery, or convenience store. STURDY CONSTRUCTION HOLDS UP TO 150 POUNDS: Our Utility Carts sturdy metal construction allows it to hold up to 150 pounds of cargo while maintaining an easy to push stability. The metal frame is built to hold up to these large loads for years of use without bending or bowing. HIGH QUALITY RUBBER WHEELS AND HANDLE FOR EASY NAVIGATION: The rubber tread on our shopping cart wheels makes it perfect to navigate on sidewalks, streets, through store aisles, or even on grass. Independently pivoting front wheels allow total control and easy navigation around corners or through tight spaces. 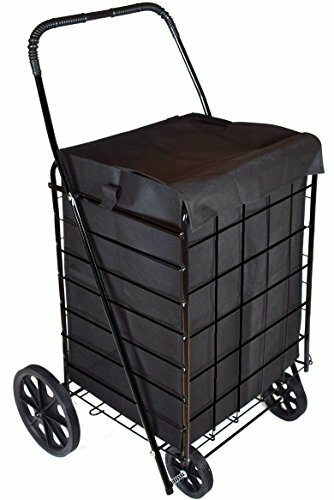 DURABLE LIGHTWEIGHT FRAME WITH RUST PROOF FINISH: The durability and rust free construction of our utility cart ensures that even after years of use your shopping cart will be rust proof and secure. Cart size is 41.75"H x 24"W x 21"D when fully expanded. ✔ THIS IS A HIGH QUALITY MAIL CART. Made by a Well Trusted Manufacturer of Shopping Carts in the Nation. ✔ INCLUDES SHOPPING CART LINER. Jumbo Size: 41.75"H x 24"W x 21"D.
✔ FOLDS FLAT FOR EASY STORAGE. Very Portable and Will Fit in Most Standard Cars. ✔ HIGH QUALITY. Rust Resistant, Sturdy & Durable Metal Construction. ✔ PERFECT FOR TRIPS TO THE GROCERY STORE. This Cart is Great When You Don't Want to Make Two Trips. If you have any questions about this product by MOD Complete, contact us by completing and submitting the form below. If you are looking for a specif part number, please include it with your message.